Like Minecraft, ARK: Survival Evolved can be a confusing game at first. Knowing how to get certain resources and how to tackle the more complicated gameplay mechanics is vital to your survival, but things aren't always obvious. We offer some tips and tricks to help you out here. Remember To Level Up Your Stats! You level up pretty quickly in ARK: Survival Evolved and the game will remind you incessantly when you can level up. Don't forget to level up your individual stats and pour all of your upgrades into the option at the top (health) instead! You can increase your health, stamina, carrying capacity, and more each time you level up. Leveling up properly makes things a lot easier. Fiber is essential for building just about everything in the early game, but where do you find it? With a bare hand (or torch), just press the Y button near any of the 3D plants you see all over the place (not the 2D ground cover). This will harvest berries, which you can eat or use to tame dinosaurs, as well as fiber. Different regions of the map have different looking plants, but they all give you the same resources. Metal is the next big important resource you'll need. You can find small amounts in any rocks you harvest with a pickaxe, but to find large amounts you need to harvest specific rocks. Round rocks next to rivers offer a slightly higher chance at metal, but for the real mother lode, you need to find metal rocks. These metal-rich rocks have a distinct light color with veins of bronze/copper-looking metal running through them. You find these rocks mostly on mountains, but also in large concentrations on certain specific lower hills. Use a tamed ankylosaurus to harvest huge amounts of metal. Oil is needed late in the game but can be hard to find if you don't know where to look. It can be found in underwater caves, as well as out in the ocean, but both of those require advanced equipment to even get to. Instead, you can travel far to the North to the snowy areas of the map, and you'll find giant, black, funky shaped boulders next to the water. These are frozen oil. Harvest with a pickaxe. Again, use an ankylosaurus to harvest large amounts of oil. A weird quirk about ARK: Survival Evolved is that you have to have warm clothes to explore the cold northern area of the map, but in order to get warm clothes, you have to kill specific animals up in that cold northern area. Bring lots of campfires and torches to keep you warm, and head north until you find a wooly mammoth, megalosaurus, and dire wolves. All of these animals will give you pelts when you harvest them. Use these pelts to make Fur Armor, and then you'll be protected from the cold. Obsidian is needed to make polymers, which is what all of the late game items are pretty much all made of. To find obsidian, travel to any mountain where you'd find large deposits of metal. Obsidian is usually higher up the mountain compared to where you first start finding metal, so once you hit metal keep climbing and you'll find obsidian eventually. Obsidian are large, flat, black rocks that are unmistakable. 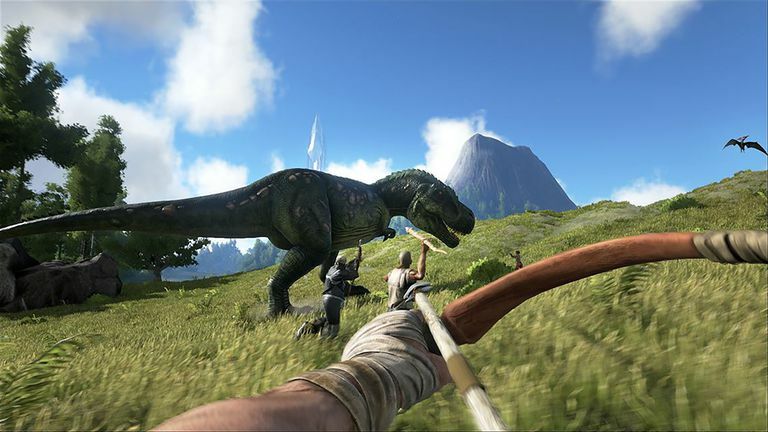 Taming dinosaurs and other animals is a big part of ARK, but how do you do it? First, you have to knock out the animal either by punching it with your bare hands or by shooting it with a tranquilizer arrow or dart. Different species require different amounts of punching/tranquilizers to go down, so be sure you have enough equipment before you take on the big boys. Once the animal is knocked out (not dead! ), you can place food in its inventory. Herbivores like berries, while carnivores like meat (and in particular, prime meat from larger animals). The animal will then eat the food and it's "taming meter" will start to increase. You want the animal to stay asleep during this process, so you'll have to manually feed it either narcoberries or narcotic to keep it asleep. Again, different species take longer or shorter times to tame than others, so be patient. When you tame a dinosaur and equip it with a saddle, you can then ride it and use it to help you with things. Certain animals are better than others at various tasks, of course. Raptors are great at not only collecting meat from their victims but also looting anything it had. Triceratops are good for collecting huge amounts of berries. Ankylosaurs are perfect for harvesting metal, oil, and obsidian. Brontosaurs can carry huge loads of cargo. And, of course, you can just ride any of the animals, so if you want to cover a lot of ground quickly, pick a fast animal like a sabertooth cat or raptor. If you're playing single-player, you can adjust sliders for pretty much anything in the game. Two, in particular, are pretty confusing, however—Damage and Resistance. Damage is how much damage you or the dinosaurs do, and resistance is how much damage you take. Damage is fairly obvious - the higher number means you do more damage. But resistance is the opposite because it works at a multiplier, not a linear scale. For example, a resistance of 2 means you take 2x as much damage, while a resistance of .5 means you take half as much as normal. If you want to be a John Cena-esque unstoppable superman, move the resistance slider to the left below 1, NOT to the higher numbers at the right. If you set it at 0, you'll take no damage from enemies (though long falls will still hurt you, as will staying in the cold too long).